Ownership / Access: Eric Rinaudo, Now a Bed and breakfast. Notes: Château de La Moissétie is a manor house located in the town of Aurillac in the Cantal. Altered over the centuries, the castle consists of a round corner tower of the nineteenth century confining an old main building of rectangular plan. Its name comes from the Moisset family, hereditary provosts of the Jordanne valley to the abbot of Aurillac1. 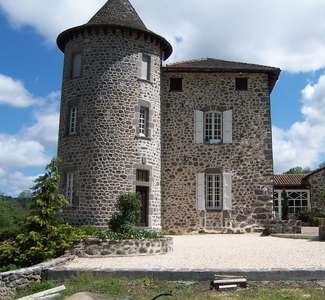 Since the thirteenth century to the fifteenth century, it remains in the Moisset family, then the family of La Roque Roquenatou (one branch attaches to the castle of Montal-lez-Arpajon) until the late eighteenth century. He then bought by Mr. Brunon whose family holds it to the late twentieth century.